Home / Ekotren Unveils New Album Cover And Streams New Track On Their Myspace. 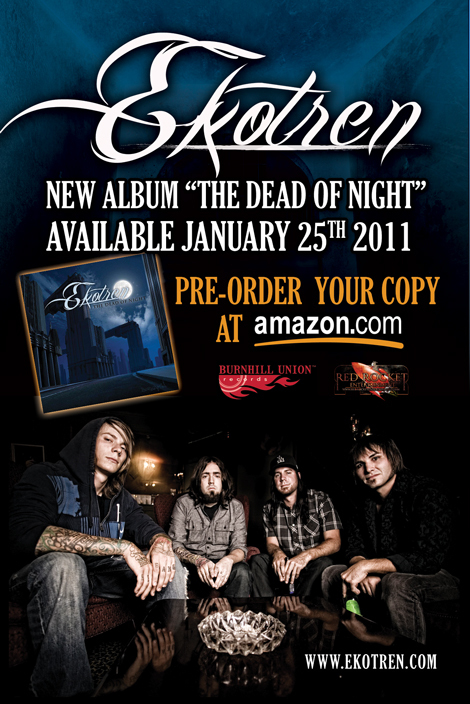 The cover artwork for EkoTren’s forthcoming sophomore album, “The Dead OF Night” can be viewed below. Due in North America on January 25th 2011 via Burnhill Union Records(E1 distro), the cd was produced by Paul Trust (Atom Smash, Endo, Diecast) who produced the band’s debut album “Light The Fire” as well . EkoTren is also currently streaming “Mask OF Lies” a track from the new album at the band’s Myspace(www.myspace.com/ekotren) .